The beauty in the art of Chinese calligraphy lies in its ability to evoke our senses of sight and sound through diverse forms of writing evolved over the changing ancient dynasties. Both calligraphy and music share similar artistic elements such as rhythm, balance, emotional tension, flow and harmony. The varied lines of calligraphy convey vitality that is akin to appreciating a lingering piece of melodic tune. From July through end of 2018, Sky One Art Gallery presents Elements of Chinese Calligraphy – A Solo Exhibition by Tan Oe Pang. Three years after his last Chinese calligraphy solo show in 2015, Tan Oe Pang returns with an extensive three-part exhibition series, featuring ninety-one pieces of his calligraphy works written over the years. The first part will kick off from 20 July and runs until 29 August at the gallery. The calligraphy of Tan Oe Pang emphasises on essential basic skills such as handling of brush and mastering variations of strokes which make up all Chinese characters through diligent practice. Beginning with learning seal script, clerical script and regular script, the artist spent twenty years to hone the foundation skills of writing proper Chinese characters. Thereafter, he practised writing archaic inscriptions found on monumental stone steles, bronze vessels and eaves tiles. Over time, Tan Oe Pang was able to distil the essence of calligraphy from the evolvement of past script types. His calligraphy inherits many centuries of tradition – marrying the visual art forms and spirit of Chinese characters – while creating a distinctive artistic style of his own. The featured works in Elements of Chinese Calligraphy evince the artist’s determined pursuit of constant breakthroughs in calligraphic art and his inclination to accentuate the importance of traditional writing skills. Born in Kandang Kerbau Women’s and Children’s Hospital (KKH), Tan Oe Pang is a leading Singaporean artist who loves his homeland. He grew up in the Potong Pasir village where people of different races lived together and he was acquainted with their diverse cultures. 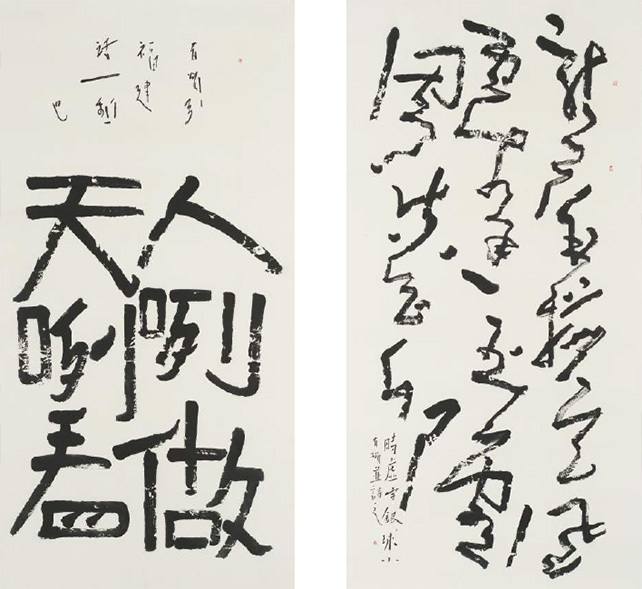 Besides writing his self-composed poems and couplets in Chinese language, Tan Oe Pang also uses the unparalleled brushstroke techniques of Chinese calligraphy to write phrases in multiple languages of other ethnic groups. They include phrases written in Malay, Tamil, Japanese, Korean as well as the Chinese dialects in Singapore – a highlight of this exhibition series. The ingenious interethnic and cross-cultural exchange is not only meaningful, but it also brings out a new visual aesthetic of written languages. The brushstrokes of Chinese calligraphy are not only restricted to writing the Chinese characters, the integration of elements in Chinese calligraphy and written languages of various nationalities gives a new perspective to appreciate the beauty of varied calligraphy strokes.